I love using the public transports in Singapore particularly train. Most of train stations (or called it MRT in Singapore) have ads that meant to educate people about everything relating to the MRT regulations or the passenger's right. For example, they have ads with a picture of young kids and a message for the passengers to let the other passengers get off first before they get in to the train. But what I like most since I arrived in Singapore when using the train was a sign with blue and white colours, and with four different pictures attached on it. 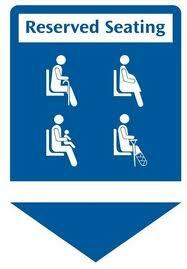 At the moment I thought the reserved seating sign was for booking seat. But then I learn that it's for those who need it more. In my knowledge, the place where I come from, we don't really have this sign (perhaps in some areas they have this). To me, giving up your seat to those who need more is like a required - that you must to give it up. But I forget, people today are different. The thing why people today are different is they're busy with their own thing - let's say busy with their phones. Sometimes they pretend to be busy and not seeing when a senior person standing front of them. Has the sense to humanity became less and lesser everyday? I'm afraid the answer is yes.